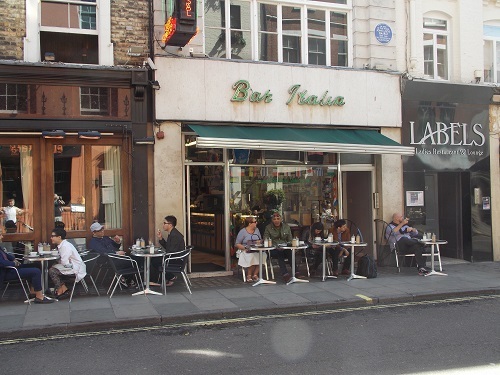 If you are looking for an authentic Italain Cafe in London, Bar Italia in Soho is the place to head for, it was opened in 1949 by Lou and Caterina Polledri. In post war Britain it became a important social centre for Italian Community and was one of the rare places you could find a good quality coffee in London. 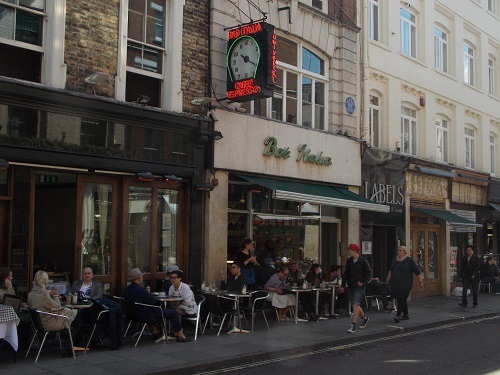 Bar Italia quickly became an institution in Soho and has been visited by many celebrities over the years. Still owned by the Polidari family, it is still a little part of Italy with Italian Football shown on the big screen at the back of the cafe and football shirts and pictures of sporting heroes dotted all over the walls. The red and white formica is an integral part of the Bar and there are still original pieces from 1949. The Gaggia coffee machine has been there fifty years. It still produces great coffee and the seats outside are very popular for watching the world go by. Almost directly opposite is the legendary Jazz venue Ronnie Scott’s. 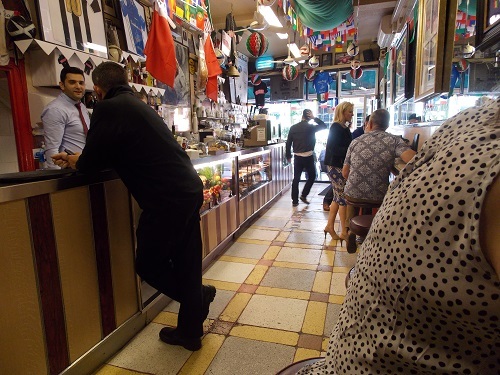 Bar Italia has the appearance of a classic Italian cafe and offers a reminder of little piece of London history when Italian cafes introduced a post war coffee culture. Bar Italia is not the only claim to fame for this building, in 1926, John Logie Baird gave the first public demonstration of television here. The blue plaque above the front door commemorates this event. By londonvisitors2014 in London Cafes on May 25, 2014 .